Boxer 1.3 has all the latest changes for IMAP accounts to fix the battery drain. There is a new Beta available (1.2.6) that includes a fix which will hopefully make the battery drain go away. Please let us know if this is a definite fix..
Can all of you who are experiencing the drain try and set your Gmail/IMAP accoutns to POLLING instead of PUSH? This will help determine if IMAP push is the problem or not. This all depends on how many messages are in your Gmail account. The next update to version 1.2 will have an improvement in Gmail IMAP syncing, so let us know if that helps. e-mail (23%) is using more battery than my screen (14% 3h45m SOT). battery usage is really strong with this app (even with Pro Version which I bought recently). Please fix this because this makes our devices unusable. Battery uasge 46% - Approx. 4 hours left. Boxer uage 32% without using the app!! Have any of you guys experience duplicated contacts as well? 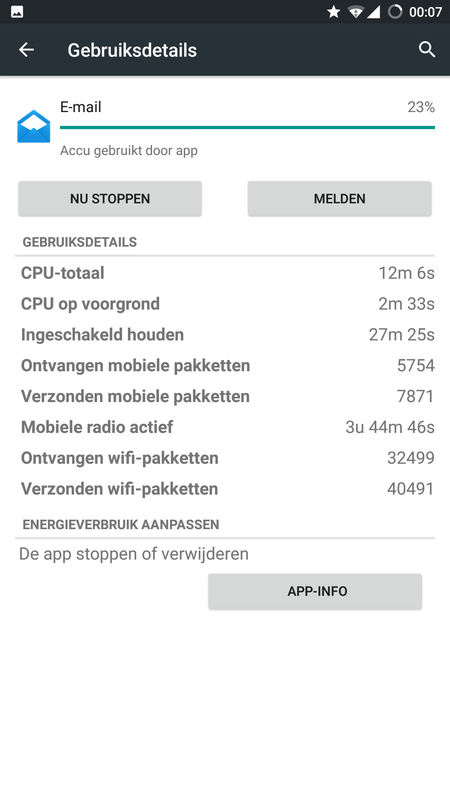 I noticed the excess of battery drain, the phone was a little bit warm and it appears on the battery usage report "DCMProvider" but as soon as I turned off the Contact Sync in accounts, everything went back to normal. When I checked, all my contacts from my exchange account (Office 365) were duplicated, some of them were added 10 or more times. I have the Pro + Exchange version, I scaled the case to Boxer but no response or whatsoever so far. It keeps my phone from going into deep sleep. From 2 hours on battery, Boxer keeps it 1:45 active for no reason. I installed version 2.3.0 (209) this morning and it appears to have resolved the battery drain problem. Thank you, Eddy, and the rest of the Boxer Android team. I have three accounts: one Gmail, one IMAP, and one Exchange account. I'm using it on a Motorola MotoX with Android 4.4.4. About 90% of my data usage is Wifi and 10% 3G/4G. I intended all along to uninstall EE once I am confident that Boxer will work reliably. There has been no visible failure, but I will go ahead and uninstall it in case there is some background conflict between the two that is causing some extra processing cycles. Thanks for your help, Eddy. I'm running 2.1and Boxer is responsible for 65% of battery usage. By comparison, my old Enhanced Email usage is 0.26%. This is a huge problem. This is definitely NOT fixed if you have an account with a lot of email incoming. I've got an account with about 200 emails/day or more and boxer kills my phone very reliably. Also on the S4. I've resorted to using K-9/Gmail instead for that account. HELP! Still reporting that Boxer is draining the battery with high CPU usage? I have 1.2.6 Pro + Exchange and I sync my contacts and calendars. Please help. With 1.2.6 the battery drain is fixed for me, thanks guys! I've only had 1.2.6 installed for a couple hours but so far so good, looks like battery usage and temps are back to normal. Thanks Eddy. I've already got it installed. Currently testing it with 1 standard Gmail acct set to push, 1 Gmail apps acct set to push, 1 AT&T (Yahoo) email (POP) set to check daily, one Outlook acct set to check daily, and 2 IMAP accounts set to poll every 2 hours. I'll report the results on the G+ beta page. Hey Eddy, changed Gmail from push to polling and it seemed to bring things down a little -- still above 40% battery usage. I'm a bit of a titanium backup rookie... probably dumb luck that i had a backup to roll back to... and it was a bit of a hassle to get the backup to work... I couldn't just "rollback" I had to uninstall boxer then reinstall it from the backup and then resetup all my email accounts. Darn, I have titanium, but didn't fiddle with setting so I don't have a backup history to pull it up. How many backups do you keep? Yea, speaking of driving people away I'm about to ditch it -- it's been one week of this and the silence from Boxer is not cool.